These cables are flame retardant, low smoke, halogen free and mud resistant, used for instrumentation, communication, control and alarm systems. 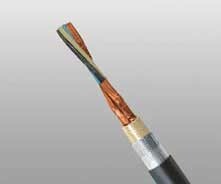 Conductors : Circular tinned annealed stranded copper wire to IEC 60228 class 2. Insulation : Halogen free EPR compound. Twinning : Colour coded cores twisted together. Individual Shielding : Each pairs/triples are screened by copper backed polyester tape in contact with a stranded tinned copper drain wire and wrapped with polyester tape. Pairs/triples are numbered with numbered tape or by numbers printed directly on the insulated conductors. Bedding : Halogen free compound. Armour : Tinned copper wire braid. Outer Sheath : Halogen free thermosetting compound, SHF2 (for TYPE S1). Halogen free MUD resistant thermosetting compound, SHF MUD (for TYPE S1/S5), coloured grey (blue for intrinsically safe). Bending Radius : 8×OD (during installation); 6×OD (fixed installed). Temperature Range : -20℃ ~ +90℃.